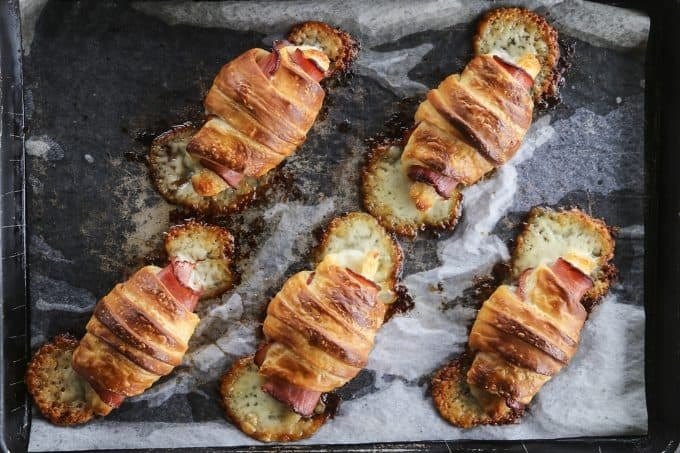 These Ham and Cheese Croissants are the inaugural feature on Our Daily Bread here on Foodie with Family, where I’ll feature a homemade bread recipe every Sunday. For more fantastic Bread Recipes, visit our special Homemade Bread page! I’m just going to go ahead and say it. When I made my first batch of Ham and Cheese Croissants I was pretty much convinced I was a magician. We’re talking about homemade butter pastry wrapped around tender ham and Swiss cheese and baked to brown, flaky perfection. The aroma while they baked was bewitching. And people. Look. When I took this pan out of the oven and set it on the cooling rack I about swooned. Bits of cheese had melted and pooled at the ends of the croissant and become crispy. The ham was toasted at the ends where it was exposed, concentrating everything I love about the flavour of ham. This is such a win for any time of year, but most especially at this time of year. 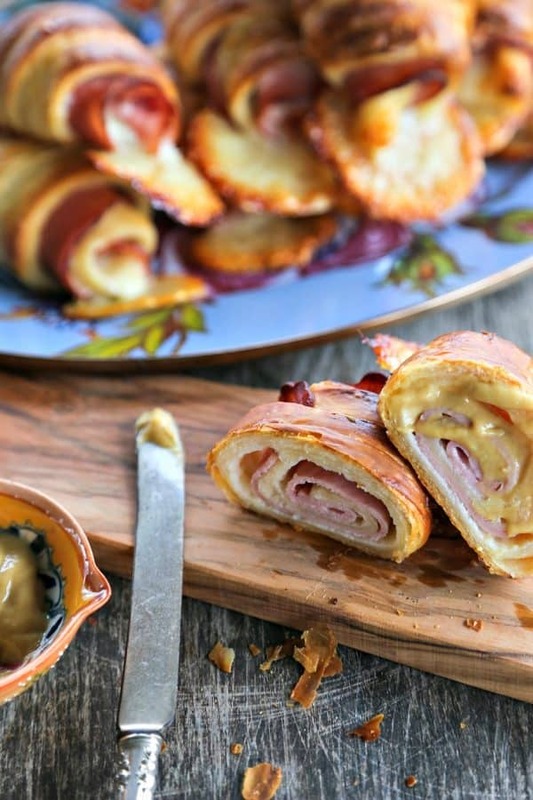 As a holiday brunch offering, there is no equal to Ham and Cheese Croissants. Can’t you just imagine sitting down to a plate with a Ham and Cheese Croissant, a little Dijon mustard, a few berries or a piece of fruit, and a mimosa or cuppa whatever you love best? 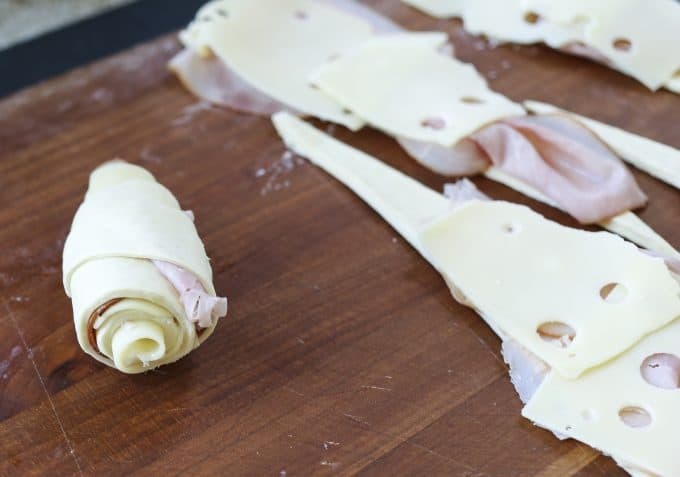 These Ham and Cheese Croissants make use of our homemade croissant dough which is also used in making pain au chocolat. If you’re inclined to do so, you can make double or triple batch of the dough (because it holds beautifully in the refrigerator and actually rolls out more easily when it is a couple of days old) and make Ham and Cheese Croissants AND Croissants AND Pain au Chocolat. I like to use ham off the bone or Virginia baked ham from the deli for these croissants. If you have leftover baked ham, you can certainly chop it finely and sprinkle it over the triangles of dough. Lay the slices of Swiss cheese over the ham to help hold it in place if you opt for chopped ham. I do advise using thinly sliced Swiss cheese for the sake of ease, but shredded block Swiss cheese will work if you can’t find slices. Don’t wrap the croissants loosely, but by the same token, don’t wrap them as tight as a drum. They should hold together alright without unwinding, but shouldn’t be so loosely wrapped that they’re slack. See this photo for reference. Are you short on warm, draft-free places for your croissants to rise? I suggest using an oven (not heated) with the light on. That seems to provide just enough warmth. If you’re in a real hurry to get them to rise, you can place a cake pan with boiling water on the shelf below the croissants. You need to let them rise until they’re puffy and a little jiggly when you gently wiggle the sheet pan back and forth. Don’t be tempted to pull the ham and cheese croissants out of the oven when they’re lightly browned. They need to reach that deep mahogany brown to ensure shatteringly crisp pastry. It’s worth it. Believe me. Please let the croissants cool to room temperature or at least barely warm before digging in. I know it’s torture, but it gives the pastry structure a chance to set up and makes them more pleasant to eat. 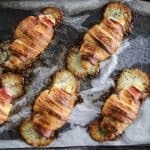 I love to eat these with a little bit of Dijon mustard on the side for dipping or spreading lightly on each bite. It’s optional, but boy is it tasty. Ham and Cheese Croissants: homemade butter pastry is wrapped around tender ham and Swiss cheese and baked to brown, flaky perfection. Roll out the dough into a rectangle that is roughly 9-inches by 25-inches. Use a pizza cutter, bench knife, or sharp paring knife to trim the sides neatly to an 8-inch by 24-inch rectangle. Working in a zig-zag pattern, cut the rectangle into 8 long triangles. Gently separate the triangles to give you room to work. Lay two slices of ham across each triangle. Lay 1 1/2 slices of cheese over the ham, with the thinner half slice of cheese near the pointy tip of the triangle. Working with one triangle at a time, gently grasp both of the corners of the base of the triangle. Gently pull to stretch slightly and begin to roll firmly but not tightly. You want it to hold together but not be squished together. Continue to roll, tugging gently back on the already rolled portion to slightly stretch the slack that hasn't been rolled yet. Do this until you reach the point of the triangle. There will be parts of the ham and cheese that stick out. This is okay. Stretch to wrap the tip around and gently press it into place. Position this on a parchment lined pan with the tip resting on the pan. Do this with your remaining triangles, placing the rolled dough at least 3 inches apart on the pan to account for expansion in rising and baking. Whisk together a large egg with a pinch of salt until even in colour. Brush the tops lightly with the egg wash. Place in a warm, draft-free place to rise until the dough is puffy and slightly jiggly. Put the egg wash in the refrigerator to use again before baking. Preheat the oven to 425F. Brush the tops of the croissant with the egg wash. Bake for 15 to 18 minutes, or until the pastry is puffed, set, flaky, and caramelized to a deep rosewood brown. Let the pastries rest on the pan for 5 minutes before transferring to a cooling rack. These are always best when eaten slightly warm on the day they were made, but if there is some weird circumstance in which they're not all eaten immediately, I have frozen them or refrigerated them and eaten them after reheating. They were wonderful. 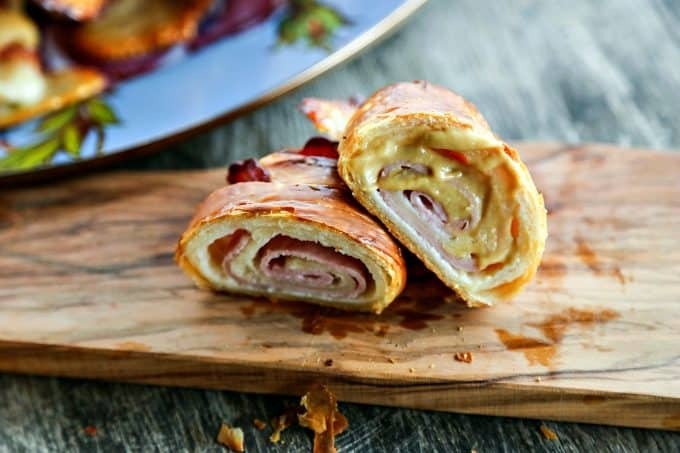 This recipe and the resulting Ham & Cheese Croissants are proof that you are, indeed, a magician! I may actually pull up my big girl pants and try to make them next weekend. YES! Yes, you should!!! And report back, please!